Flash-400 is a 4x 100W individually addressable warm white LED’s. 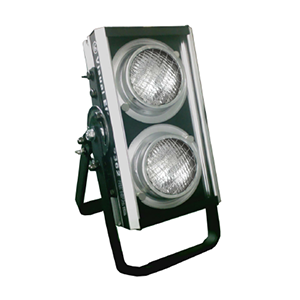 The blinder is housed in an aluminum cover which makes it the perfect outdoor IP rated fixture. It has a powerful output with smooth color. Flash-200 is a blinder with 2x100 W warm white LED each controlled separately. It has a powerful output with smooth color. The SL NITRO 510 C is a cutting-edge new LED based strobe luminaire that provides intense bursts of light and dynamic effects. The Famous P-364 is a compact and light-weight lighting fixture with uniform and widespread high-power illumination field for any application. The Famous P-368 is a compact and light-weight lighting fixture with uniform and widespread high-power illumination field for any application. The Famous P-362 is a compact and light-weight lighting fixture with uniform and widespread high-power illumination field for any application.